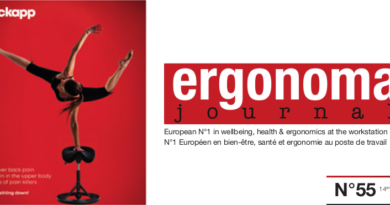 In the course of successive trade fairs, off-the-shelf presentations and design weeks, Ergonoma Journal has been able to see how designers, manufacturers in the office sector offered attractive, convivial, mobile and agile furniture. In short, products intended for sociability, collective (meeting) spaces, like “lobbies” of star-rated hotels. A more intimate and cozy atmosphere highlighted by noble materials: real wood, marble, “couture” textiles, associated with an important use of colors. seen on sofas and armchairs. Colors that intersect with functional spaces where ergonomic seats, fixed or height adjustable work surface, connectivity, acoustic treatment, screen mobility symbolize the “workbench” of intellectual workers. As seen in reports on sites in this issue, intangible production is no longer a matter of places provided by the employer to exercise a means of hierarchical control. It’s is rather the commitment and competence required from employees deployed outside the office. They have to develop social ties made of close proximity to colleagues, inside and outside company networks, or around the “coffee machine” which becomes an essential actor of a good socialization.